Dubai: The UAE Under-19 team led by Aryan Lakra left for Malaysia on Wednesday to play in the ICC Under-19 Cricket World Cup Asia Qualifier to be held in Kuala Lumpur. Lakra, who bagged the most valuable player of the tournament and best bowler award in the Emirates Cricket Board (ECB)-organised UAE National Inter Academy League, was rightly chosen as the captain of the squad with Karthik Meiyyapan as his deputy. Incidentally, Meiyappan, playing in the prestigious Bukhatir League, had produced a deadly spell of 4-31 to steer Development XI to a 67 runs win over Defenders Cricket Club last week. The UAE play their first match against hosts Malaysia on Thursday, followed by matches against Nepal on Saturday, Kuwait on Sunday, Singapore (April 16) and Oman (April 18). Fifteen matches will be played across three venues in the Kuala Lumpur area — Kinrara Oval, Bayuemas Oval and Selangor Turf Club. The UAE team had worked hard to win a place in the World Cup through rigorous practice. “It will be a dream come true for all of us if we can qualify for the World Cup. Being part of the World Cup is a great learning experience for anyone. A couple of good performances in the World Cup can earn one recognition around the world. We will try and earn that honour,” said Lakra, who cracked a century and bagged three wickets in the practice game against former UAE Under-19 team two days ago and also cracked a ton in the Emirates Under-19 inter emirate tournament final. The ICC Under-19 World Cup is scheduled to be held in South Africa in January-February, 2020 with 11 Test playing nations and five regional qualifiers. Nigeria has already clinched a slot from the African qualifier. 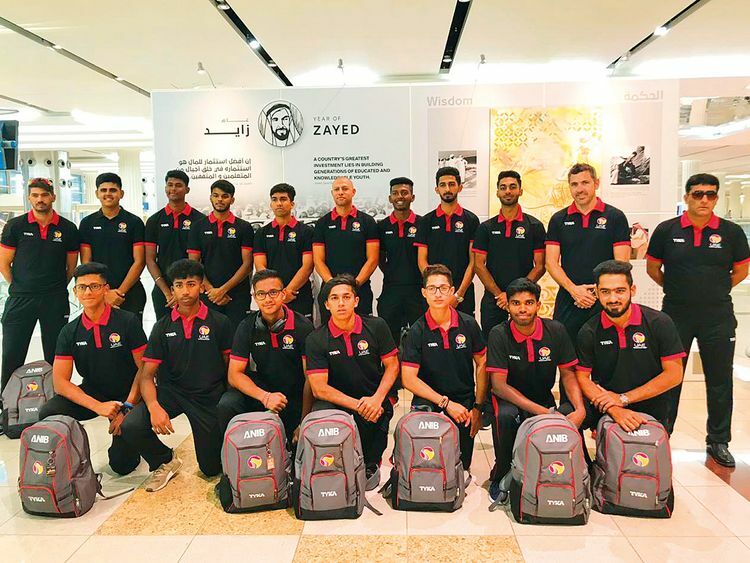 UAE team: Aryan Lakra (captain), Karthik Meiyappan (Vice Captain), Aaron William Benjamin, Muhammad Akasha Tahir, Alishan Sharafu, Anand Kumar, Ashwanth Valthapa Chidambaram, Mohammad Faraazuddin, Rishab Mukherjee, Niel Roshan Lobo, Osama Hassan Shah, Vritya Aravind, Syed Mahammad Haider Ansh.